UCSD — 22–3 overall and 14–3 in the CCAA — is two games behind Cal State San Bernardino, which holds the No. 1 spot in the conference. The UCSD women’s volleyball continued its winning streak, beating Humboldt State and Cal Poly Pomona last weekend. The Tritons’ back-to-back wins broke a tie for second place in the California Collegiate Athletic Association, with UCSD sitting two games behind first place Cal State San Bernardino. Last Friday, the Tritons hosted Humboldt State, a team they beat 3–1 on the road earlier in the season. UCSD struck first to put the Tritons in a solid lead (9–4). However, the lead quickly dwindled as the Lumberjacks edged their way back into the game. Bad blocking on the Triton’s side made it hard for UCSD on defense, but UCSD eventually took control again and finished the first set 25–21 with a cheeky tip by sophomore setter Heidi Sierks. The Tritons dominated the next two sets. Humboldt State committed several errors and could not keep up with UCSD’s aggressive play. The Tritons led 13–3 before ending the match with an impressive 25–8 score. Sophomores Sophie Rowe and Danielle Dahle both had outstanding games, tallying 10 and eight kills, respectively. 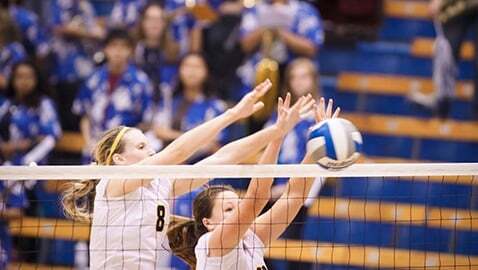 Junior middle blocker Sara McCutchan ruled the net with an amazing 11 kills on 11 attempts. Her 1.00 hitting percentage tied the NCAA Division II record, done only six times before. On Saturday, the Tritons took on the tougher Cal Poly Pomona, who UCSD beat 3–2 the last time the two squads met up. The Tritons won the first set 25–14 with tough serving and patient defense. But in set two, Cal Poly Pomona hastened the pace on the attack, to win the second and third sets. However, the Tritons stepped up to the challenge and easily won 25–15 in the fourth set. In the tiebreaker, both teams relied on defense. With the score at 10–9, UCSD came up with three consecutive points to make it 13–9. The Broncos took a quick point back, but after a crucial Cal Poly error, junior opposite hitter Caitlin Brenton recorded a kill for the match point, ending the game at 15–10. Brenton was solid in all areas, posting career-highs with 27 kills and 33 points. The junior transfer’s 14 digs was also a career-best. Libero Brittany Lombardi also had a good game, leading the match with 33 digs, a season high for UCSD. Setter Heidi Sierks posted a double-double with 56 assists and 16 digs. With the wins, the Tritons improve to 22–3 overall and 14–3 in the CCAA. With five games left in conference play, UCSD is two games behind Cal State San Bernardino, which holds the No. 1 spot in the conference (20–5 overall, 16–1 in the CCAA). Next weekend, the Tritons will head out on the road again, battling Cal State Monterey Bay next Friday, Nov. 15 and Cal State East Bay on Saturday, Nov. 16.